Life Cycle Assessment (LCA) is the most rigorous scientific methodology that can be applied to the selection of building materials or assemblies. LCAs examine the impact of a building material from its creation to its disposal or recycling. They also consider the energy used and emissions caused to create, transport, manufacture and refine the material. The result of these LCAs is that real wood outperforms plastics, steel and concrete across the board. This should really come as no surprise considering the energy to produce real wood comes from the sun and the energy to produce concrete, plastics and alternative decking products comes from burning fossil fuels. With LCAs, science clearly shows that using real wood can save energy and reduce greenhouse gas emissions. Wood is the only 100% renewable and reusable building product. Wood has one of the lowest environmental impacts overall among furniture and decking materials. Wood requires less energy to manufacture and releases exponentially less greenhouse gases than alternative products. Redwood, Western red cedar and pressure-treated pine are harvested using sustainable, responsible forestry practices. As a result, North American forests have grown by 20% since 1970. Although wood products make up 47% of all raw materials used in the U.S., their share of energy consumption is only 4%. Redwood is a renewable natural resource. 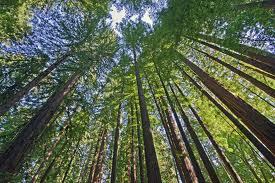 As redwood trees grow, they remove carbon and release oxygen through photosynthesis. When redwood trees are harvested and turned into lumber products, most of the carbon from the tree stays trapped in the wood. Foresters replant harvested areas, continuing the cycle of removing carbon from the atmosphere and trapping it in the wood. The Coastal Redwood (as opposed to the protected Sierra Redwood) is the only redwood grown to produce lumber products and is the fastest growing commercial softwood species in the country. In 30 years, coastal redwoods can grow to between 90 and 130 feet. Redwood forests today cover more than 1.5 million acres in California. About 95% of the land that was redwood forest 200 years ago is still redwood forest today. More than 350,000 acres of redwoods have been set aside in public parks and preserves, and the 1.2 million acres where redwood can be harvested are managed in compliance with California's strict forestry regulations. Visit our q & a page for additional information.